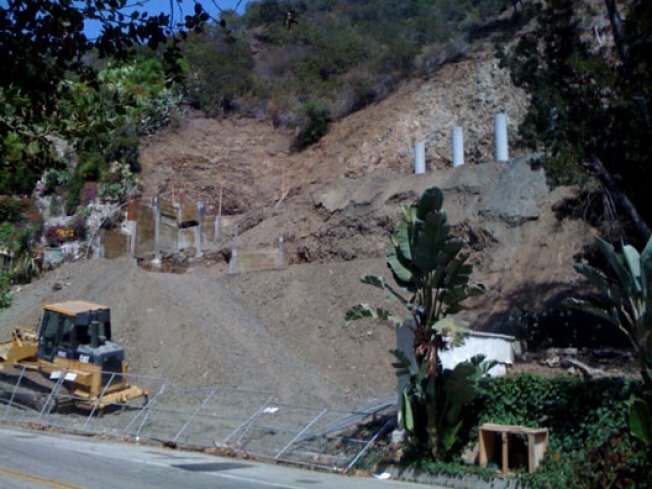 Big Dig on Beverly Glen Being Abandoned? Ah, nothing like a good mystery from the Glen. Sending in the above photo, a reader writes: "This picture is from a construction site in the 1600 Block of N. Beverly Glen Blvd. This excavation began several months ago and work progressed very quickly for awhile. There were visits from the fire department and other city personnel and the work continued. However, for the last few months all work has ceased. Even the heavy equipment was left on the property. The work must have easily cost several hundred thousand with cranes bringing in the caissons and cement and dump trucks making several runs during the active periods. Most of the homes in the area sell for $600,000 to $900,000 on the Glen. How would anyone ever make there money back on such a folly? If you or your readers know what the heck is going on I would love to know." Yes, it's always puzzling when the equipment is left behind.